Made by R A Lister and Co in Dursley, Gloucestershire, England, c. 1896. The Dursley Pedersen bicycle has some unique features including a lightweight triangular frame of thin diameter tube, duplicated to give extra strength, and a curious hammock-style saddle, made from woven cord suspended between the handlebars and rear frame. The idea was that the seat followed the movement of the body and was said to be comfortable, making the bicycle easy to ride on long journeys. The bicycle features a triangular frame of light duplicated metal tubes with a saddle slung between the front and rear forks. It has a 3-speed hub gear. The 26 inch wheels have pneumatic tyres and tangential spokes. Other features include rod-activated brakes to both wheels, an original Pedersen leather tool bag, mudguards, pump bracket, drop handlebars, acetylene lamp at the front and lamp bracket on the rear. The bicycle is finished in bottle green. The hammock-style saddle is not original, and there is a non-original bracket under the saddle. The chain guard and pump are missing. The acetylene lamp, object number H7809, at the front has been added for display. The bicycle was designed by Mikael Pedersen (1855-1929), a Danish engineer and farm machinery inventor who was known for his centrifugal cream separator. He emigrated to Britain in 1893 and worked for R. A. Lister, the engine and cream separator manufacturer in Dursley, Gloucestershire. Pedersen was an enthusiastic cyclist but found the safety bicycle seats uncomfortable. He designed a woven saddle made of silken, wiped or leather cord 45 yards (40 m) in length. The net was soft to sit on, and the seat was supported at the front by an adjustable leather strap. Pedersen advertising noted the saddle had "perfect ventilation" and did not create "perineal pressure". After finding his seat did not fit a conventional safety bicycle frame, Pedersen designed a new triangular one said to have been based on the Whipple-Murphy truss used in railway bridges at the time. The frame gave lateral stability to the machine. It was made from 14 separate narrow diameter tubing rods, joined in 57 places, making 21 triangles throughout the bicycle. At first Listers was not interested in plans for Pedersen's new bicycle design but let him use some buildings as a workshop at the Lister factory. The first Mikael Pedersen bicycles date from 1896 to 1897. The Dursley Pedersen Cycle Co. was established in 1899 and owned jointly by Mikael Pederson, Robert Asthon Lister and his son Charles. This company ceased operation in 1917, but other firms continued making the bicycles until 1921. It is estimated that between 28,000 and 30,000 bicycles were made in all; however, the frame numbers indicate that probably no more than 8,000 were actually made. The first Dursley Pedersen frames were not adjustable; only the seats went back and forth. After customer complaints the seat construction was altered so it could be adjusted vertically. Later, the bicycle was produced in eight different sizes for men, based on their inside leg measurement; frame sizes 1 to 8 measured from 27 to 38 inches. Women's bicycles came in three sizes, A, B and C (with the then sensitive inside leg measurement not being mentioned). The ladies' model had a slightly different saddle to eliminate the stretch from the handlebars to the rear of the frame. This was achieved with an extra pair of forks at the back, with the saddle suspended between them and the main rear part of the fame. During the First World War cycle production fell gradually and was partly taken over by other companies around Gloucestershire. Licence fees to Pedersen remained unpaid, and his poor business sense saw him cheated out of payments. Increasing alcohol misuse, a failed marriage and poor health saw him reduced to a pauper back in Denmark by 1920; he died 9 years later and was buried in an unmarked grave. In 1995 bicycle enthusiasts had his remains exhumed and reinterred in Dursley with a headstone to ensure his achievements would be remembered. The bicycle was purchased by the Museum in 1954. It was one of nine bicycles and tricycles from the collection of Richard G. J. Nash of Weybridge, Surrey, England. Richard Grainger Jeune Nash (1910-1966) was born in Ireland but grew up in Weybridge, Surrey. During the 1920s he became an automobile engineer at the famous Brooklands racetrack nearby. Brooklands was the world's first purpose-built motor racing circuit and opened in 1907. It was also the venue for early bicycle racing and soon attracted pioneering aviation manufacturing companies as well. In 1932 Nash established a hill climb record in his Frazer Nash, "The Terror", up Brooklands Test Hill . During the 1930s he was actively building up a collection of old aircraft, automobiles and bicycles which was known as the International Horseless Carriage Corporation. In 1939 motor racing ceased at Brooklands and during the Second World War the site was taken over for military aircraft production. In 1952 Nash offered to sell his entire collection of some 23 veteran cars, 46 pre-1900 bicycles and seven pre-1918 aircraft to the Museum. At that time his address was noted as The Beeches, Hanger Hill, Weybridge, Surrey. Nash had family members in Australia and apparently felt his collection would be of value to show the history of technology in the colonies. 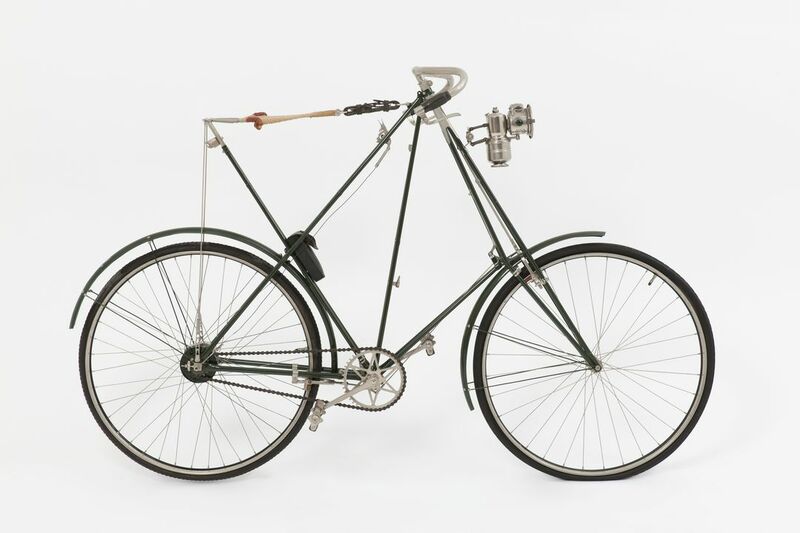 Because of the prohibitive transport costs from England to Australia, the Museum was only in a position to purchase 9 bicycles from the Nash collection. The Museum's Director A.R. Penfold, inspected the bicycles in a hangar/store at Brooklands while visiting England in 1953. The bicycles were subsequently shipped to Australia on board the "SS Orion". Unfortunately, the bicycles came with no provenance. Much of the remainder of the Nash collection appears to have been dispersed to museums throughout Britain. After the war civilian aviation continued at Brooklands, with several Concordes later built on the site. After the British Aerospace factory closed in 1986 the Brooklands Museum Trust was formed and a museum of the site opened in 1991. In 1985 this bicycle (of the original nine bought) was restored by the Museum. The old paint was removed and the bicycle taken apart and reconditioned. A total of 350 individual parts of the bicycle were nickel plated, and the leather was treated.